Opened last February, Ruumy's Tavern is the last venture of restauranteur Mike Kocak who also owns Akdeniz, a Mediterranean restaurant located Midtown West (Ruumy is the nickname of one of his relatives). There, Executive Chef Matthew Sadownick, who worked at Gramercy Tavern and Union Square Cafe, crafted an interesting menu that he calls comfort food, made of small dishes as well as large ones. This is the interesting thing: we had a debate with the Chef and my fellow bloggers who were present at the dinner about what comfort food is as they disagreed with the concept. For most of the bloggers, it was the classic mac and cheese or mashed potatoes and not what was served at Ruumy's Taven; my view (and Chef Matthew agreed with me) is that it is subjective as it all depends on where you come from and what reminds you either your childhood or your home. For me for instance, it is steak frites, potato au gratin or crepes. So, before talking about the menu, let's talk about the place: There are really 4 main parts: the main dining room, a room downstairs with an adjacent private room that is also the wine cellar, as well as a garden in the back. It has overall a rustic feel, warm and comfy with its exposed brick, terra-cotta floors and reclaimed wood tables. I love the photos of New York hanging on the walls, photos that were taken by a friend of the owner. They do not have a full liquor license, but have a nice list of wine from all over the world as well as sake, as it is in the wine category, from which they make cocktails. I tried a few of their wines, in small quantity of course! I like the rosé that is often not well considered, although quite refreshing. There was a French one, a Sancerre, 100% Pinot Noir 2016 from Karine Lauverjat that had a nice strawberry aroma. Food wise, we were there for a treat. We started off with the chicken liver mousse that was very good, perfectly made, and hummus, a good French / Middle Eastern composition, the former being my favorite. It came with pickled vegetables: pearl onions and beets. 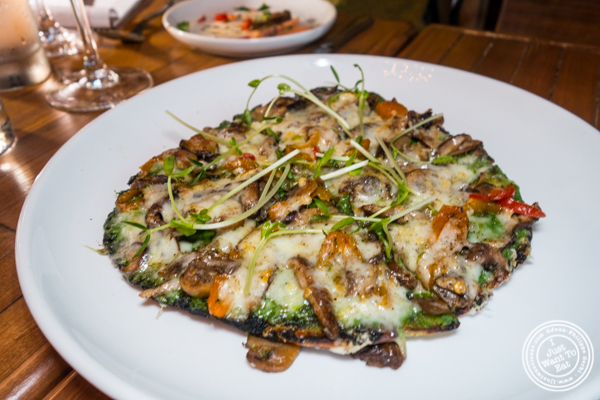 Then, a duo of flatbreads: the first one was shiitake and portobello mushrooms with fontina cheese and salsa verde. The second, raven and boar ham with swiss cheese, black pepper and creme fraiche. This was my favorite, the ham having a nice smokiness and it had a slight kick to it. Next were vegetables: blistered shishito peppers drizzled in preserved lemon yogurt and grilled baby zucchini with cheese. Both were good, my favorite being the peppers that have a Japanese inspiration. It was followed by red snapper that was perfectly cooked and had a nice crispy skin, presented on a wild mushroom salad with a lemon and fish vinaigrette. Not only the fish was delicious, but I admit that the salad, made with pickled enoki and portobello mushrooms was superb, and had a nice acidity. One of my favorite dishes was the burger topped with cheddar and pancetta: the patty, made with brisket, top round and some 30 days dry aged meat was phenomenal, juicy and tasty, perfectly cooked to a medium rare. The last entree was the steak frites with béarnaise sauce that was also succulent! The very good NY strip (tender, juicy) was accompanied by a homemade béarnaise sauce and herb French fries. I would go back for this and for the burger for sure! The béarnaise was a twist on the original by the Chef and was very good with the fries. Last was dessert and it was spectacular: it was a chocolate mousse with dulce de leche, candied peanuts and coconut. I could have eaten a bucket of it! This was a very good dinner and quite comforting for me: Ruumy's Tavern is a surprising restaurant serving some food that you would not see on a lot of "tavern" menus, associating more this term to the beer than such a wonderful cuisine. I would definitely go back for the steak frites or burger, knowing that it would not be a problem for Jodi as they have few interesting vegetarian dishes that stand on their own and are not just an afterthought.